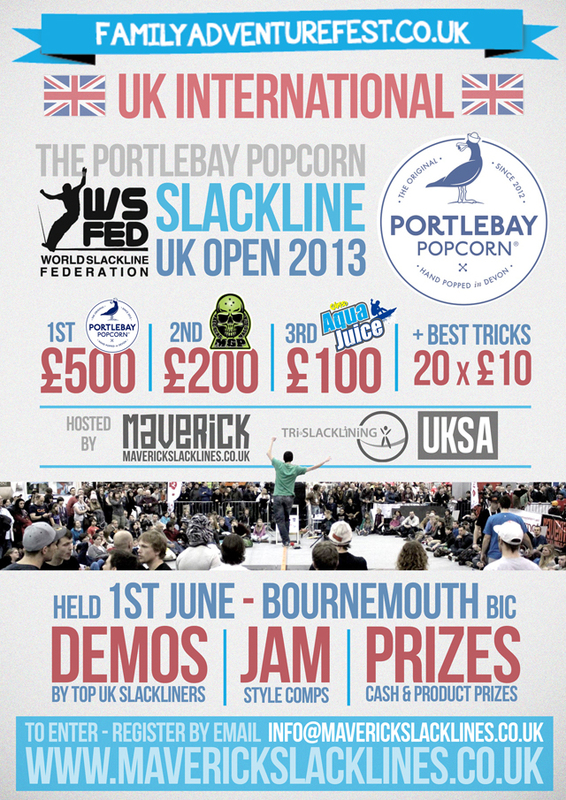 Maverick Slacklines are excited to announce that the date is now set for the 2013 WSFed Portlebay UK Slackline Open to be held at the Family Adventure Festival in the Bournemouth BIC on Saturday the 1st of June. Following the massive success of the Winter Jam in London this event is set to be huge! Registration will close 28th of May. + Cash Spot prizes for best trick & best newcomers! Ranked competitors will be seeded directly to the final 16, the remaining places will be determined by a qualifying competition in which entrants will be judged by a 90 second solo performance prior to the finals. WSFed Worldranking Points up for grabs! The Maverick Slacklines team along with Tri-slacklining will be giving demonstrations and holding workshops throughout the 3 days of the show, between the 31st May to 2nd June.